When it comes to makeup, experts always say that less is more. 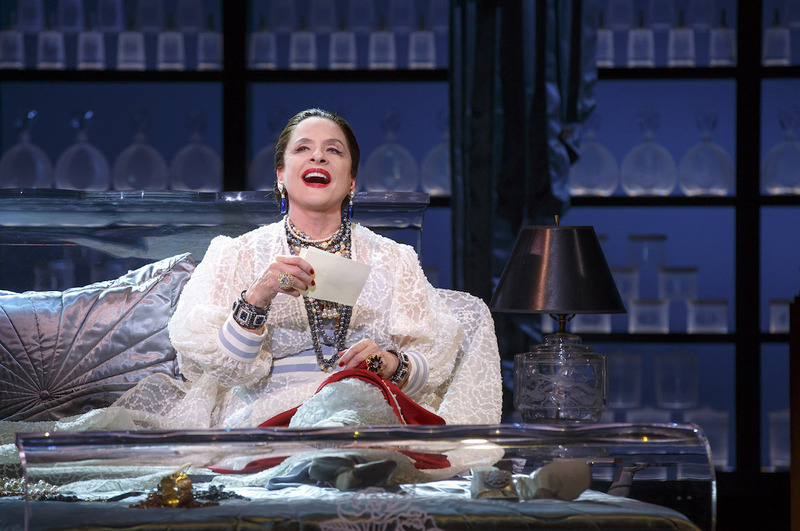 Though the new musical War Paint chronicles the rivalry between the groundbreaking cosmetics titans Elizabeth Arden and Helena Rubinstein, it doesn’t abide by this essential rule of beauty. 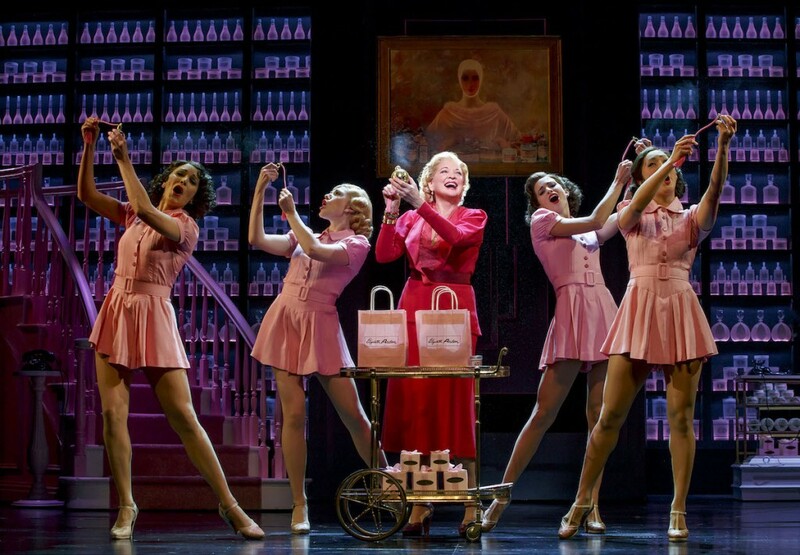 Directed by Michael Greif, scored by Scott Frankel (music) and Michael Korie (lyrics), and with a book by Doug Wright, War Paint takes audiences through Arden and Rubinstein’s decades-long battle for dominance in the beauty industry. They are portrayed by two of Broadway’s bona fide leading ladies: Arden by Christine Ebersole; Rubinstein by Patti LuPone. The two businesswomen comprised a classic case of opposites. Born Florence Nightingale Graham, Arden (1878-1966) was a WASP from Canada; Rubinstein (1872-1965) was a Polish Jewish immigrant. Arden’s infamous red door opens on stage to the pink salon where femininity flourishes among her pastel ceramic jars. Rubinstein provides a more clinical approach to her products, adding hormones to day and night creams marketed in crisp shades of white and blue. The rivalry between the two women drives the musical, which unfolds between 1935 and 1964. The social and political turbulence of those years sees the cosmetic industrypermanently altered. Arden and Rubinstein adjust their products to accommodate and promote rationing for the war, but as post-war culture ushers in a more economical approach to beauty, both refuse to market their wares to a lower-income clientele. Lewis and Harry Fleming (Douglas Sills), Rubinstein’s trusted aide de camp, each defects from his original team to join forces with the opposition. Upon learning of these betrayals, Arden and Rubenstein speak of their devastation. Sadly, the two male characters are severely underwritten. Sung in rich harmony by Ebersole and LuPone, that song is crucial to War Paint. The show’s delineation of sexism is painful. The score is packed with solos for the leading ladies, though the abundance of songs, including ensemble numbers, proves a burden rather than a blessing. There are simply too many. Many of these songs ruminate on beauty – what it is, what it means, and how to achieve it. The lyrics ponder if the two titans were liberating women, or imprisoning them with products sold with strategies that prey upon the buyers’ insecurities. This topic is evoked beautifully on David Korins’ sets, which are adorned with shelves filled with frosted colored bottles enhanced by Kenneth Posner’s flattering lighting. 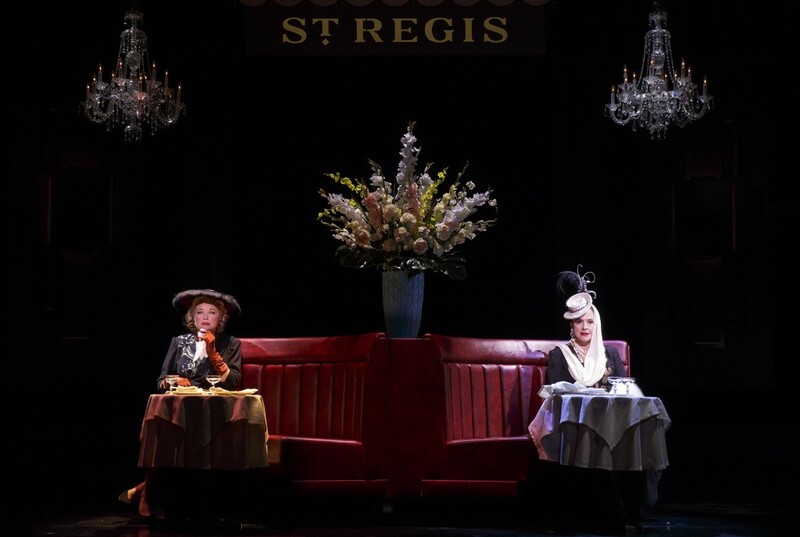 Ebersole and LuPone’s period-perfect costumes are by Catherine Zuber – appropriately subdued for Ebersole and bold for LuPone. Christopher Gattelli’s atmospheric choreography vibrantly establishes the time period and the mood of each scene. The grand performances by Ebersole and LuPone are solidly developed and rooted in emotions: ambition, envy, loneliness, and pride. Ebersole’s warbling vocals question her life choices, especially in the wistful song “Pink,” in which she reflects on the color’s meaning in her business and her life. It emerges that she has never been able to conquer her patrician snobbery. LuPone’s powerful voice expresses the ferocious drive that propelled Rubinstein to her place in the industry and in the world beyond it. Thinly-veiled anti-Semitism kept her from purchasing an uptown triplex, so she bought the building instead. Despite their physical proximity – along with working a few blocks from each other, the two appear to have regularly lunched back-to-back at the St. Regis – Arden and Rubinstein never met in person. War Paint gives them an imaginary brief encounter, in which they admit the grudging respect they have for each other and reflect upon what might have been if they’d joined forces and worked together instead of competing. War Paint‘s messages aren’t subtle. However, this lush, lavish musical is decidedly enjoyable—if a bit over-done.